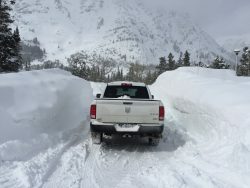 West Glacier, MT – Spring plowing operations have begun in Glacier National Park. Last week crews plowed to the camp store in Two Medicine and through Chief Mountain Road on the east side of the park. This week, plows will work on Many Glacier Road on the east side of the park, and Camas Road on the west side of the park, as weather conditions allow. The park is also using other snow removal equipment to remove snow from campgrounds and other visitor areas to speed spring melt.